Second Japanese pressing of the US remixed version of the album. This label design was used from January 1980 to the end of 1982. 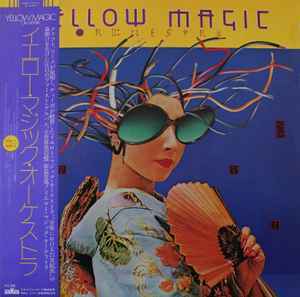 Needless to say the importance that had Yellow Magic Orchestra on the early international electronic scene since their first legendary album 'Yellow Magic Orchestra', a reference to an unimaginable amount of electronic producers since then. The masterpiece long play made by the Japanese trio Haruomi Hosono (bass, keyboards), Yukihiro Takahashi (drums, electronics, percussion, vocals) and Ryuichi Sakamoto (keyboards, percussion), despite its ground-breaking (and out of the ordinary) perspective, was acclaimed not only in Japan, but on the International scene, and became very popular. Yellow Magic Orchestra's milestone LP brought timeless classics such as the "Computer Games" noise clash milestone whose initial bleeps were sampled by 'Quadrophonia - Quadrophonia' (1990) and 'Sweet Excorcist - TestOne' (1990); 'Fire Cracker' was largely played by DJs such as The Wizard (A.K.A. Jeff Mills) on WJLB; another one was 'La Femme Chinoise' (that even became a soundtrack for TV Program), among many other innovative electronic compositions. Definitely a quintessential album of innovative compositions on the history of Electronic Music.